The Formula 310 BR is a luxurious runabout with all of the ammenties for day boating in comfort with a classic interior, a large enclosed head and impeccible performance you'll appreciate for all of your watersport needs. This 2019 model includes Twin MerCruiser 6.2 MAG Engines with Emission Control Technologies 300HP Each w/DTS and Bravo III Outdrives. Flagship Graphic B (Crystal Blue Metallic w/Silver Diamond, Radar Arch, Extended Swim Platform, Electric Windlass w/Chain & Stainless Steel Anchor and much more! 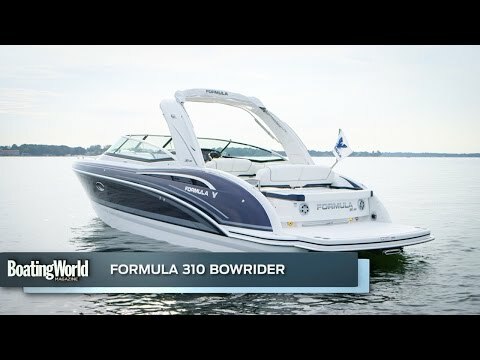 Check out the full specs to see all of the added options and upgrades on this 310 Bowrider. Visit Lakeside Formula....Michigan's largest authorized Formula dealer...located at Emerald City Harbor on the Nautical Mile!